Val Mulkerns reads from her new book, “Memory and Desire”. Hard to believe that Val Mulkerns published her first novel in 1951. For this writer, in any case, as the niece in the background struggling with a first tome, she is an inspiration: this is her tenth, sixty-five years later. In between came two more novels, three short story collections, two children’s books and many thousands of words of journalistic work, as she became a columnist for a national newspaper in the seventies. Standing at the podium in The Irish Writers’ Centre on Thursday night, she read an extract from the first story in the collection, “Special Category”, inspired by her father, Jimmy Mulkerns, who had been imprisoned in Frongoch prison camp (via Knutsford Jail) in 1916 following his participation in the Battle of the Four Courts. 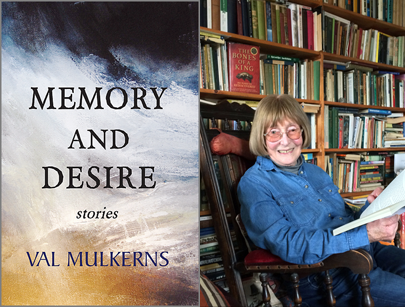 While Val Mulkerns already has another book on the way – a memoir – it’s a great treat to see this new selection of her short stories available this year ahead of it: for me, it was a wonderful re-introduction to her work, especially the short stories for which she is so renowned, and as it turns out, in my own case, put them between new covers with 451 Editions so that they can be read by others. With its beautiful cover painting by Louise Newman, the book strikes a pose in bookshops, and presents a recurring theme in the collection: the sea. 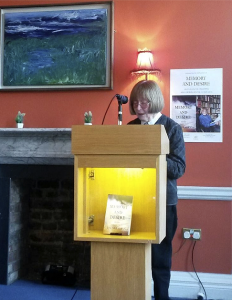 The launch of “Memory and Desire”, which included fellow authors, literary friends and family as well as others drawn by the new title, was a splendid success. 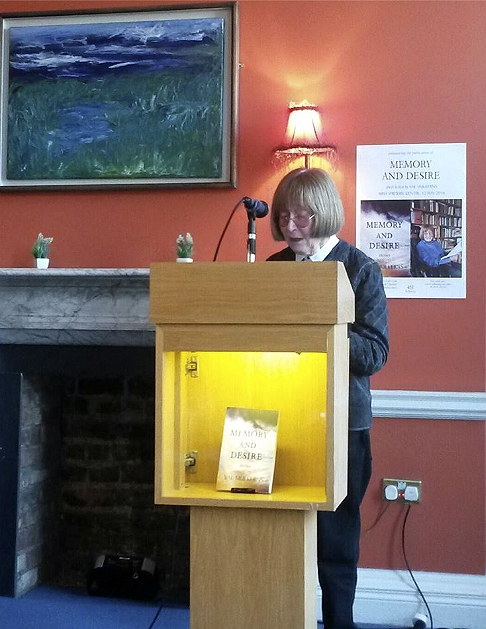 Professor Ronan Conroy gave the best of introductions: smart, witty and full of warmth, and the reading was delivered by the author herself with perfect pitch and timing, drawing in the audience until they hung on every word. In the wake of Prince’s death, publications have been quoting Sinead on the subject of Prince – a story which broke after I interviewed her for Hot Press one Christmas long ago. I wanted to re-post the interview here in its entirety, since Sinead had so much more to say when we spoke in December, 1990. Due to overcrowding in JFK and strong headwinds, the plane is late touching down in LAX. Although the inevitable tinselly Christmas decorations are in evidence all over, it hardly feels like Yuletide to photographer John Francis Bourke and me. In New York we shivered in the icy winds belting down Broadway as we waited for a cab, here we roll down the car windows and laugh at the palm trees. Bikers zoom along in open jackets, helmetless. At the “Cat and Fiddle” on Sunset, people are eating at tables outside on the patio. In December. The splendid, glittering tackiness of the West Coast boulevards at night is countered the following day by a pristine, cloudless sky and unusually hot sunshine, which scalds into the hotel bedroom where we’ve scheduled an interview with America’s favourite diva, Sinead O’Connor. Or just “Sinead”, as they’ve taken to calling her. Americans have even finally succeeded in pronouncing it properly, a sure sign of acceptance. LA Weekly has a centerfold spread advertizing “RED, HOT AND BLUE” that lists the performers on the album: “U2, Sinead O’Connor, David Byrne” etc. Sinead is at the very top of the list, as she has been on most lists in the U.S. for most of this year. Until the January release of “Nothing Compares 2U”, she was respected high-cult Princess, the prized choice of the connoisseur. With the subsequent smash hit of the single, video and album “I Do Not Want What I Have Not Got” she went straight up there alongside Madonna and Whitney, outclassing and outselling both.